THIS WEEK: San Francisco’s notorious “Demon of the Belfry” goes to the gallows. 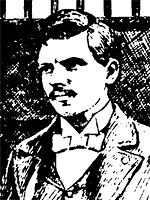 Sure, Jack the Ripper had set a certain tone for serial killing just a few years earlier, but the crimes of Theodore Durrant were even more shocking. See, Jack’s victims had been prostitutes, but San Francisco’s “Demon of the Belfry” had murdered a pair of girls who were respectable churchgoers. In his very own church. On the day before Easter Sunday, 1896, a group of women held a meeting at the Emmanual Baptist Church in the Mission District. As they bustled about the small kitchen preparing tea, one woman reached towards a cupboard, looking for teacups. As the door swung open, she shrieked in horror and fainted — crammed inside was the butchered and violated body of Miss Minnie Williams. Minnie had been a devoted church-goer, and the police quickly connected her death with the case of another young woman who’d gone missing two weeks earlier. The vivacious Blanche Lamont had also been a member of the church, so the grounds were searched from bottom to top. The body was found in the dusty, disused bell tower — two weeks dead, arranged like a medical cadaver, and brutalized in an equally horrifying way. Suspicion fell upon a young medical student and assistant Sunday School superintendent who had been close to both women — Theo Durrant. News of the police’s interest in Durrant spread through the Mission and then infected all of San Francisco. By the time he was actually picked up, only a massive police presence prevented the angry mob from stringing him up on the spot. Bankers, judges, hack drivers and bootblacks gossiped about little else, and people lined up for blocks to view the victims’ identical white coffins at a local funeral parlor. The City’s many newspapers were absolutely thrilled with the story, of course — during the next couple of years, well over 400 articles about it would appear in the San Francisco Chronicle alone. It wasn’t just that the two young women were such “upstanding citizens” — the angle that made it horrifying and captivating to San Francisco was the fact that Theo Durrant was such a nice, normal guy. He was a handsome young man, friendly and open in demeanour, well-liked, of excellent reputation, and (again) the assistant superintendent of a Sunday School. Our modern clichÃ© of the serial killer as the “guy next door who wouldn’t hurt a fly” was still a long way off. It seemed absolutely incredible to San Francisco that such a — well, such a ‘gentleman’ could be capable of such bestial and savage acts. As Virginia McConnell points out in her excellent book on the case, Sympathy for the Devil, the murders played upon deeper fears in the gaslit City, conservative anxieties about certain changes sweeping through society. The era of Emancipation was beginning to emerge, a time of ripening feminine independence signaled by bloomers, bicycles — and the sudden presence of young women without chaperones. Could it be that the horror and sexual violence of these murders was the inevitable result of … modernity? In any case, attempts to explain Durrant’s behaviour abounded — and his stone-faced composure drove San Francisco into a frenzy of speculation. Modern psychology wasn’t available yet — Freud was in Vienna inventing it at the time of the murders — so newspapers expounded theories about secret Barbary Coast orgies, racially-tainted blood, exposure to perverse German medical literature, even that the shape of Durrant’s ears somehow predicted his monstrousity. And though most of what was written was nonsense or circulation-boosting fiction, it was almost universally agreed that the man was guilty. By the time the trial began, the case was so over-exposed that — reminiscent of the OJ Simpson case — 3,600 potential jurors needed to be examined to come up with a final twelve. The trial lasted three weeks, and San Francisco hung on every word. 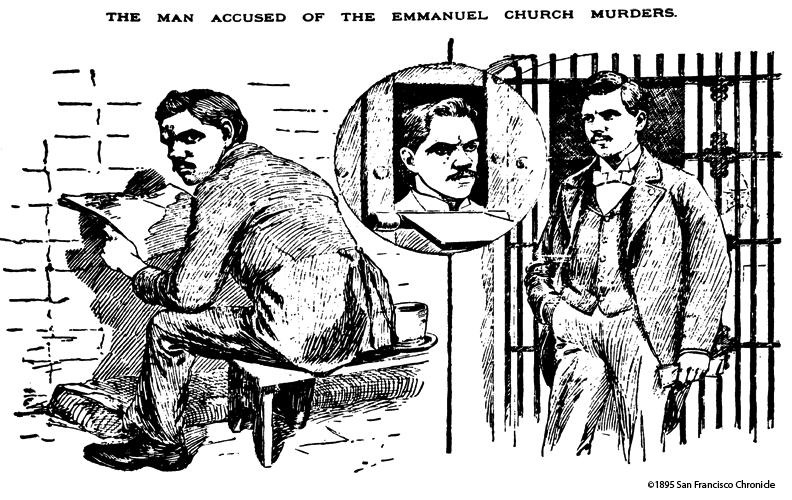 Page after page of courtroom dialogue was published, complete with detailed illustrations and interviews with anyone even remotely connected with the case. Human nature being as weird as it is, the handsome Durrant received lots of attention from young woman, including a number of marriage proposals — and a pretty blonde dubbed the “sweet-pea girl”, brought him a bouquet of flowers every morning. Durrant’s insistance upon his innocence never wavered — and it is quite true that the evidence against him was entirely circumstantial. But it was also overwhelming. 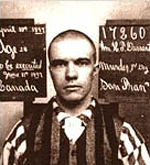 Durrant had been involved with both of the victims, had not only been placed at the scene of both crimes, but was apparently the last person seen in the company of each girl. The day that Blanche Lamont vanished, he had been spotted downtown attempting to pawn several women’s rings, and a medical school classmate testified that Theo had confided certain sexual preoccupations. And there was plenty more. 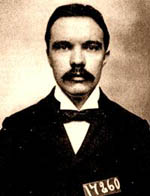 Durrant’s conviction in the newspapers was upheld by the jury and the court, and he was sentenced to death by hanging. Though the case was appealed, allowing the circus to continue for several months, eventually Durrant’s legal options just ran out. The execution was set for January 7th, 1898. Throngs of people gathered around the prison on the day of the execution. Horse-drawn buses rattled back and forth, delivering loads of curiousity-seekers. Boys on bicycles had been hired to patrol the telegraph wires leading to San Quentin, making sure that no one could clip the lines to prevent a possible gubernatorial pardon from coming through. That pardon never came. But even after two years of suspense and morbid anticipation, inside the execution chamber before an amphitheatre of onlookers, Theo Durrant was still as cool as the proverbial cucumber. Then, with the noose actually around his neck, he declared his blamelessness for the final time. The Chronicle reported the next day that this performance had given the hangman a nervous breakdown, and one of the death row guards confessed that “All through the case I believed Durrant to be guilty and thought he would break down at the last, but the coolness he displayed on the gallows and the speech he made declaring his innocence … fairly made me tremble”. Well, probably. And if he hadn’t been caught, those two poor girls would probably not have been the last of his victims. On the other hand, the evidence was circumstantial, and there is the tiniest sliver of an outside chance that someone else was responsible. The pastor of the church had certainly behaved in an odd and suspicious manner. And what’s more, an old miner had ridden into town a week or two before the hanging and told anyone who would listen that he’d run into a man on the trail who’d confessed to the whole thing, in detail. Who knows? All I will say is this: capital punishment is pretty damn final. The scene of the crime, the Emmanuel Baptist Church, is long gone. It stood in the Mission District, on Bartlett Street between 22nd and 23rd — according to one source, more or less where the apartment building at 155-165 Bartlett stands today. After the murders, police on the neighborhood beat are said to have dreaded night duty, swearing that they could hear the dead girls’ screams. The church had something of a cursed history anyway, with one pastor a suicide, another disgraced by sexual impropriety, and a third — you may actually remember the Reverend Isaac Kalloch — was shot by Charles De Young. In any case, it was ripe for removal from this planet, and a few years later, it burned — or was burned — to the ground. One final note — after Durrant’s execution, no cemetery in San Francisco would accept the murderer’s remains. The problem was finally solved by shipping the body down the coast — to Los Angeles. Wow! What a story i have read. Never heard of this. It’s really dark and scary. It will make a great movie! I am a Durrant,born in 1966 @ 45min south of Toronto ,my Grandfather was born William Durrant in England in the late 1910s. This is a very chilling article. What an amazing story, pity that they didn’t have the DNA technology that we have today, as this would have been perfect to use for the truth. Its amazing even before they hung him he was convinced that he was innocent,and normally people would have cracked and told the truth but I guess in this case we will never know. Thanks for the read. FYI: the year of the murders was 1895, not 1896. Otherwise great article!